If you frequently shop at Target, you already know this retailer can help you save money on anything from pillows to Pepsi. With nearly 1,800 stores across the U.S., the retail giant has made its reputation as a low-price mecca. But as easy as it is to save money at Target, those with a little advanced Target I.Q. can save even more. GOBankingRates.com asked savings experts to offer 25 money-saving tips to make your Target shopping experience better than ever. Click through to see how you can save money the next time you shop at Target. Because most Targets mark down certain departments on specific days for clearance, knowing that schedule can help you find the best deals. “For instance, you’ll find the best deals on clearance electronics on a Monday and sporting good clearance on Thursday,” said Christy Palmer, founder of the All Things Target blog. Here’s a kick-in-the-teeth sort of a moment: You finally buy that dress you’ve been craving only to see it go on sale the next day. Well, at Target, you can get the difference between what you paid and the new sale price refunded, said Palmer. So for any item that goes on sale within 14 days after purchase, just bring in your receipt and Target will adjust the price for you. Some exclusions do apply, so make sure you read Target’s policy before claiming a price adjustment. Related: Target Vs. Walmart: Which Price Match Guarantee Saves More? Wait, shop Amazon to save money at Target? Yep, and other select retailers for that matter because Target has a price match guarantee. As expected, there are some rules and restrictions. But in general, Target will match the lower price from select online or local retailers. Bring in proof of the current lower price with your original Target receipt to Target’s guest service desk. End caps are the shelves at the end of the aisles, and they are often filled with choice items marked way down. Look for the ones marked “Clearance.” “Most of these are the ones facing the walls, not the main walking aisles, so you may have to do some searching for them,” said Palmer. Clearance items are some of the best deals at Target, Palmer said, and they are marked down to certain levels in a certain order. “First, items will get marked down to 15 percent or 30 percent off, then to 50 percent off, and finally end up at 70 percent off,” she said. Holiday items will be cut by 50 percent the day after the holiday — 30 percent for candy. But wait a week or so, and products could go down to 70 percent off. Then, a few days later, if anything is left, they’ll go to 90 percent off, which is practically free. Want to cash in on clearance items without dealing with the Target parking lot? Good news: Target has an online Clearance section with items in just about every department. And don’t worry — you’re not going to get stuck slogging through pages of women’s shoes and toddlers’ toys to find a desk lamp. The site is categorized. If you’re saving money by not getting a paper, you can still get in on all the discounted fun by checking the ad online at Target.com. Just look for the “Weekly Ad” tab on the site’s top ribbon. It will have pages of deals from a few dollars off to 25 percent off discounts — or more. If you’ve done your pre-Target-run prep properly, you might have more than one coupon for a single item. No worries: Target lets you stack coupons. So don’t be shy about handing the checkout person a Target coupon, a manufacturer’s coupon and even a third coupon, such as Target’s Cartwheel discount for the same item. No, not down the aisles; use Target’s Cartwheel app. Download the app, and put the coupons you want in your list. When you visit Target, you simply present your barcode via your smartphone, and you will receive the discount. “By using the Cartwheel app, you can save an extra 5 percent to 50 percent off,” said Palmer. And if you’re not sure if it’s a Cartwheel-discounted item, no problem. “Just scan the UPC code of an item you want to purchase with the phone app and it will tell you if a Cartwheel offer matches up with the item,” said Palmer. The really cool thing is that it can be stacked with other coupons. To save even more money at Target, sign up for an Ibotta, Ebates, BeFrugal or Checkout 51 account. These online programs and smartphone apps give you money back for selected items you buy at Target or other participating stores. Each service is slightly different, but the bottom line is you receive cash back for the items you buy. If you have an iPhone or Android smartphone, you can download the Target App, which lets you find and add Cartwheel deals as well as shop Target’s Weekly Ad. Plus, you can find coupons. Simply download the app, tap “mobile coupons,” and fill out the form. Once the coupons start flowing, you can merely present your smartphone to the cashier for scanning. Want to save on every single Target purchase? Sign up for Target’s REDcard. It offers 5 percent off at the register on your entire bill, free shipping at Target.com and an extra 30 days to return items. You might want to sign up for the debit version instead of the credit version because the 20-plus-percent variable interest rate on the credit card could wipe out any savings. Yep, just like Donald Trump and Taylor Swift, Target tweets. You might have to slog through a lot of splashy ads for things like Popsicles and summer dresses, but pay attention and you’ll also be alerted to deals on new items or free shipping windows. That’s worth a hashtag or two. Whether you’re buying for another couple or getting hitched yourself, Target’s wedding registry is a great way to save money, said Jeanette Pavini, a savings expert with Coupons.com. It comes with great perks for both giver and receiver. “Givers get free shipping on all orders of $25 or more,” Pavini said. And after the event, newlyweds get a coupon for 15 percent off remaining items on their registry. You can knock up close to 10 percent off your bill by buying discount gift cards at sites like Gift Card Granny, Giftcard Zen or Raise. The cards are real gift cards that you use like cash, so the bonus is that the gift card savings is in addition to any savings with coupons or sales. Time is money, right? Well, the Curbside service — which is available for Target in select areas of San Jose, San Francisco, New York, New Jersey, Philadelphia and Chicago — can help you save a ton of it. Basically, you place your order from the Target of your choice, then pick it up at the curb. “You won’t even have to leave you car,” said Palmer. Target’s Dollar Spot, which is right at the entrance to the store, is a great stop for serious bargain-hunters, said Palmer. Items in this section are often just $1 but can be as much as $2 or $3, she said — and even these items get marked down. How often have you run into a market for a gallon of milk and some eggs and come out an hour later with a cart full of extra stuff? That usually spells the opposite of saving. “Planning really is one of the biggest keys when it comes to saving money,” said Palmer. So take 20 minutes before you leave for Target and plan your trip. “Make a list and stick to it,” she said. “Those Target buyers seem to know what people like, so it’s very easy to see something you just have to have.” If it’s really something you need, don’t worry; you’ll be back. 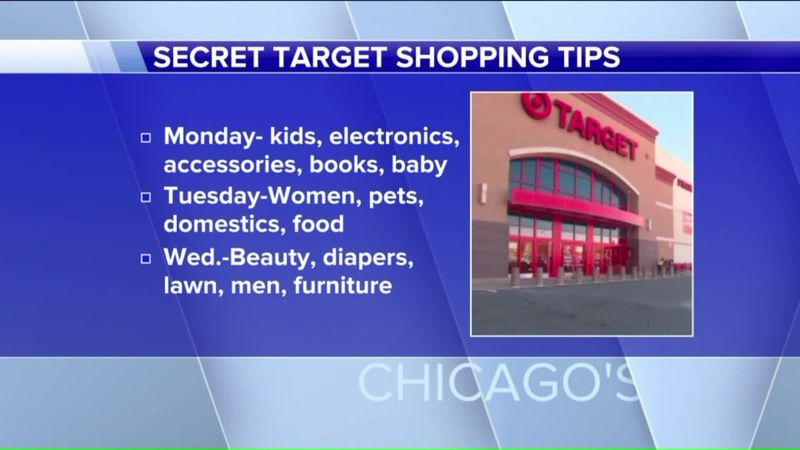 Occasionally, Target will offer a Target gift card when you buy a certain number of specific products, said Palmer. “For example, they [might] give you a $10 gift card when you buy two boxes of brand-specific diapers or a $5 gift card when you buy three bottles of brand-specific shampoo or conditioner,” she said. So keep an eye on the in-store signage, AllThingsTarget.com or your favorite savings website for these gift card offers. Bring in your own reusable bags, and Target will give you a 5-cent discount at checkout for each reusable. It’s not much but it can add up — especially on those big shopping days. So far, the savings seem to be adding up for shoppers and the environment: Target shoppers have used more than 190 million reusable bags instead of paper or plastic, according to Target’s website. Working out is great for your health, but workout clothes can hurt your wallet. To combat that, check out Champion’s C9 line or workout clothes for Target, said Lori McDaniel of Offers.com. “You’ll save as much as 50 percent compared to the regular Champion line on items like leggings,” she said. And she added that Target shoppers won’t give up any quality with the C9 line. Don’t rush out that door: Many high-value coupons will print after your receipt. You will receive them upon checkout, and Palmer said they can vary from 20 percent off a certain department to 50 cents to $5 off certain items. No wonder Target shoppers come back.